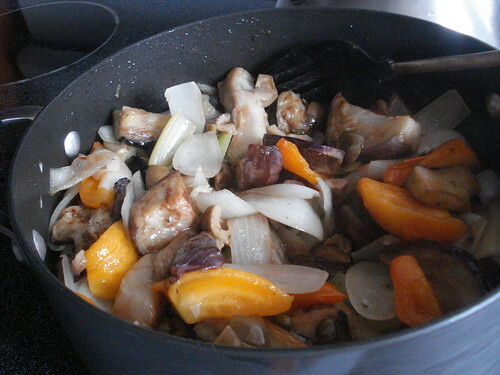 Still not back in the groove of trying new recipes yet, but I am cooking. 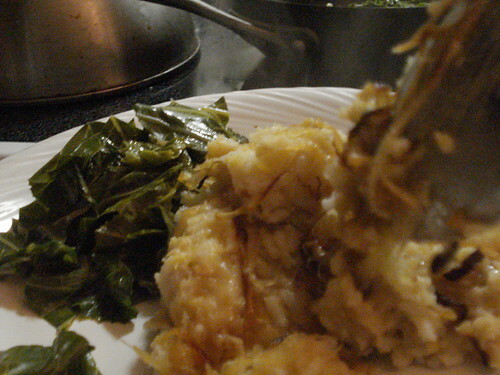 Tonight was mujadarah, with collard greens on the side. 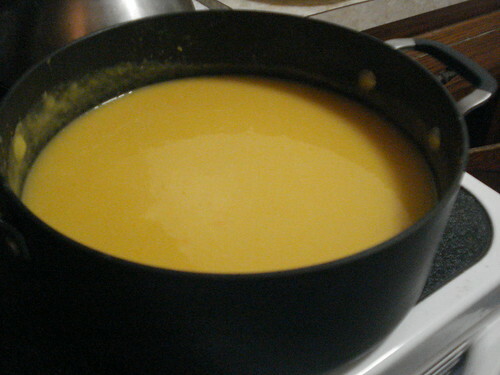 I used red lentils this time, which makes for a slightly creamier and smoother dish. 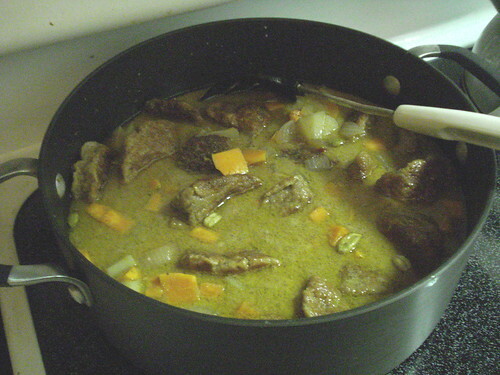 Green lentils keep their shape and texture more distinctly; red lentils melt in a bit. 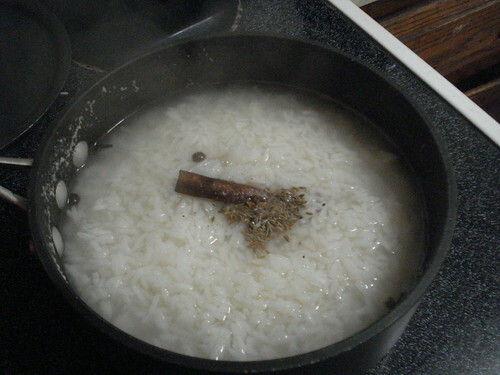 I’ve started using whole allspice, cloves and cumin seeds as well as a cinnamon stick. I got curious about how well it would work, and I have all these allspice berries. It can be a bit tricky to dig out the whole spices before serving, but the cloves are the only ones reliably hard to find, and they’re not going to hurt your teeth if you bite down on one. 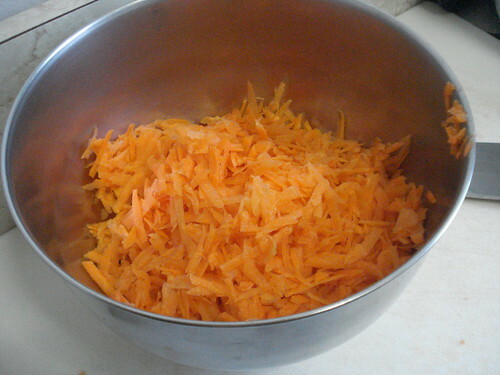 And end up with this much at the end. 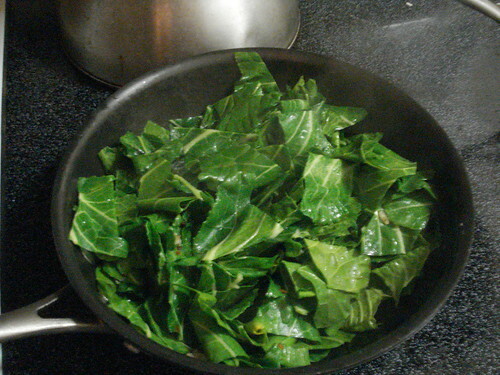 For a green vegetable accompaniment I made collard greens. 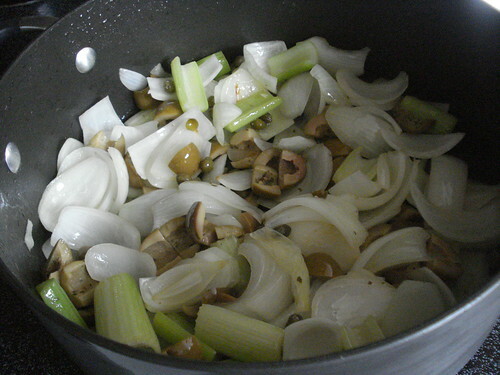 I start by sauteeing chopped garlic in olive oil, then adding a bit of kosher salt and red pepper flakes. 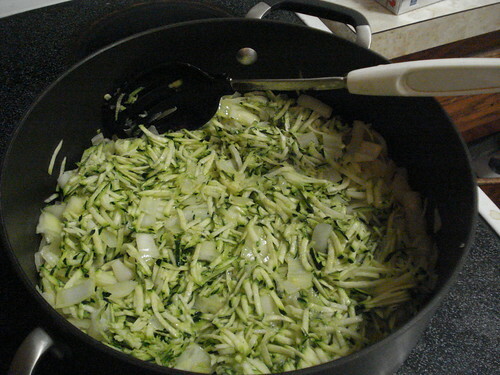 Then I toss in the chopped collard leaves and toss to coat with the oil and mix in the flavorings; after a few minutes of that I add a little bit of water, put on the lid, turn down the heat, and let it steam for about 15 minutes, more or less. I thought this might be a good opportunity to try out the Slap Chop, which I received at the office holiday white elephant gift party. (I was only a little bitter about losing out on the bottle of Brooklyn bourbon.) I was pretty skeptical about the merits of this device. I’m kind of in Alton Brown‘s camp here: if it isn’t a multitasker, I’m not sure there’s room for it in my kitchen. And he has a WAY bigger kitchen than I do. The Slap Chop promises to be “your all purpose chopper for all your chopping needs.” This is only true if all the items you need to chop can fit beneath the blades — about a two-inch clearance. 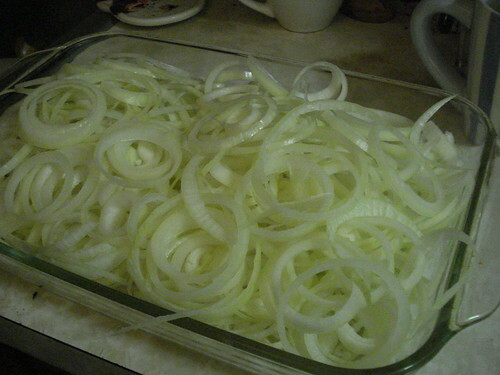 So if you have something larger to chop, like an onion, you have to cut it down to size, which means for a lot of food you’re already going to have to get out a regular knife. 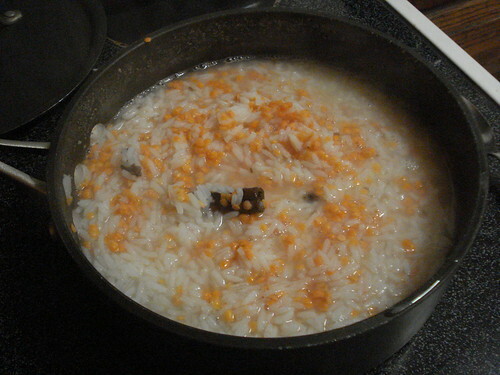 I decided to try it on some garlic, four cloves of which fit easily within the chopper lid. 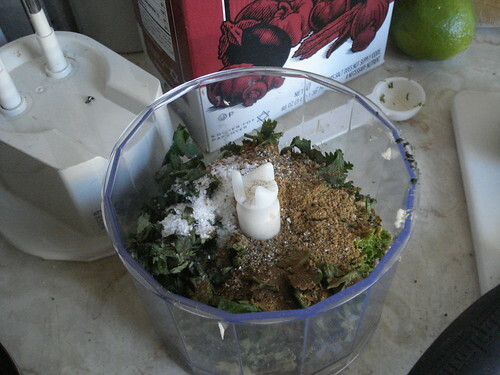 (You don’t need to use the lid; you could place it right on the cutting board, so you could chop things that are broader than the base of the device but not taller.) 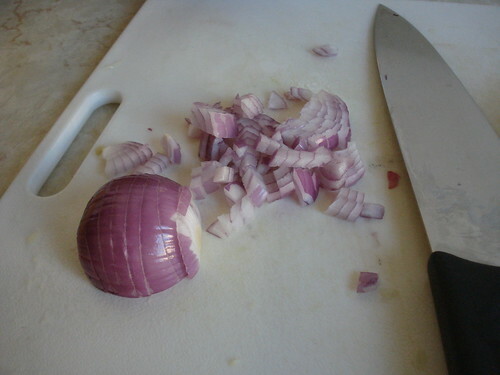 I pushed the plunger several times and ended up with well-chopped garlic, not perfectly uniform — but no worse than I usually get it with a knife. I think the garlic chopping went more quickly than if I’d used a knife. 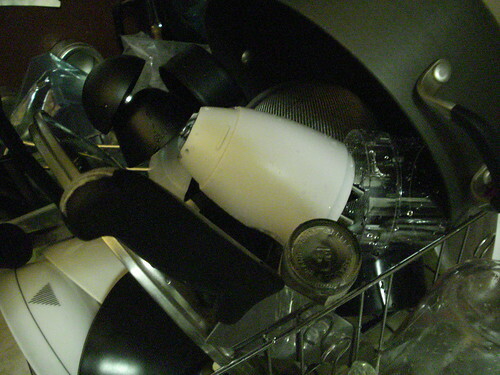 Of course, then I had to disassemble it to wash. It’s not especially difficult to wash, and I wouldn’t say it’s any less safe to handle than a sharp chef’s knife, but it does take up a lot more space. 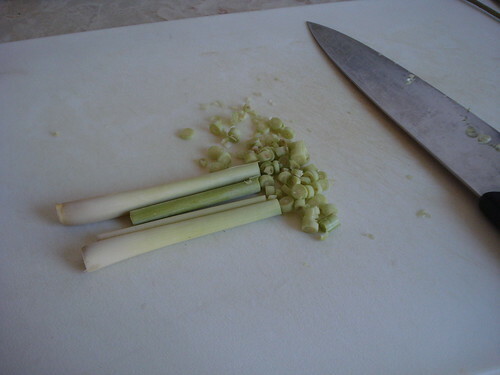 And a chef’s knife can also be used for chopping larger items, slicing, peeling (well, you do have to be careful with that, other knives are better but it can be done), smashing a clove of garlic, and doing more precise cuts. The Slap Chop can’t do any of that. 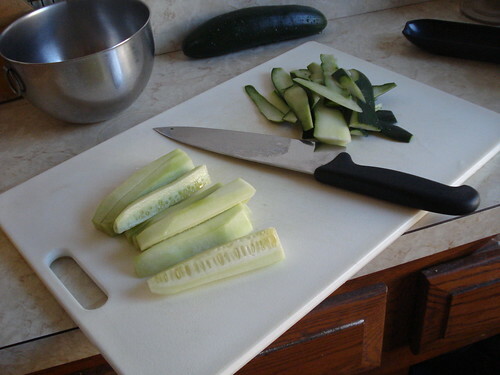 So if you really like to have lots of gadgets around, you may like this one, but if your space or funds are limited I’d recommend investing in a good kitchen knife and the time it takes to learn to use it skillfully. 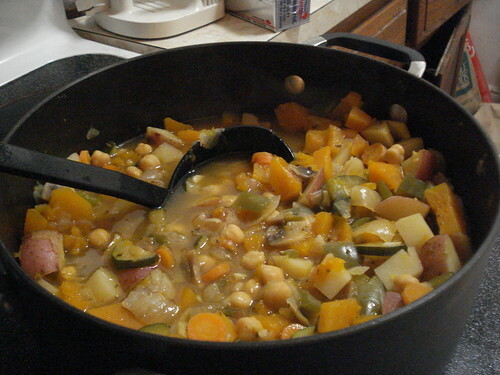 Anyway, this is a nice hearty meal for a cold night, and it’s totally vegan. Which means you can either enjoy it as part of a vegan lifestyle, or feel virtuous enough to eat half a pint of Ben & Jerry’s for dessert later. Not that I am talking about anybody in particular. So now I have a question for you. Just because I think the Slap Chop is a little silly, that doesn’t mean all kitchen gadgets and tools are silly. In a few months I’ll receive my “Jeopardy!” winnings, and should have a little bit left over from taxes and paying debts to have a little fun. 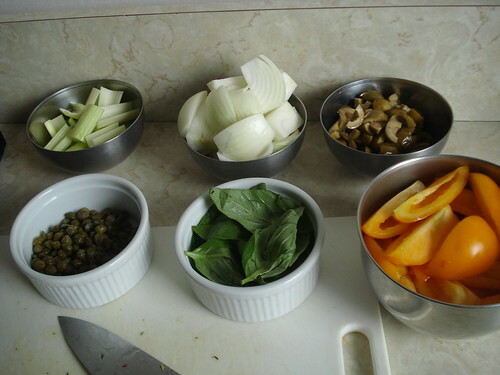 What are your favorite kitchen tools and gadgets? If you had an extra few dollars in your budget — maybe even $100 or $200 — what’s the next kitchen item you’d buy, and why? Please share your ideas in the comments section. 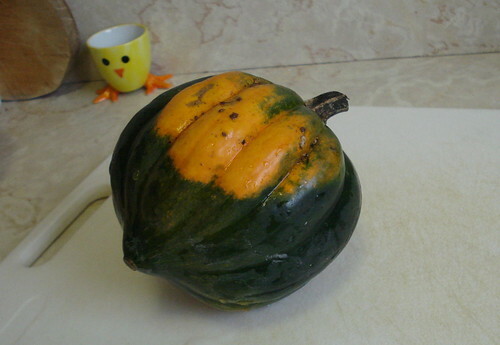 My plan is to set up a twice-a-week blogging schedule: A post early in the week about something I cook over the weekend, and a post later in the week about either a cooking experience or a food-related subject, such as things in the news or weird products I come across. (Rejoice: There is a SlapChop review in our future.) 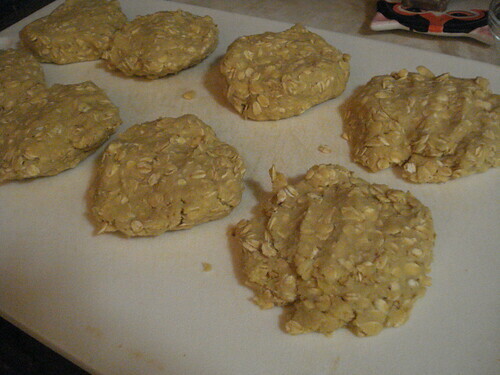 I meant to kick off that schedule last week with the chickpea patties, but am in catch-up mode. Better late than never. I made the chickpea patties because, quite frankly, I was broke and needed something I could do cheaply with few new ingredients to buy. I’m in catch-up mode financially as well; we had to squeeze in an unexpected trip to Los Angeles in November and it was what is euphemistically known as “off-budget,” and then I had to do my holiday baking, which involved stocking up on butter and nuts and some other non-cheap ingredients. So I looked at my dwindling store of canned beans and thought, veggie burger, there’s got to be an easy one I haven’t made yet. 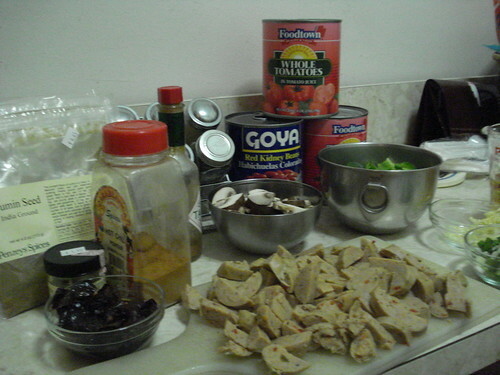 I was surprised to discover that there aren’t that many veggie burger recipes in my vegetarian cookbooks. Or maybe I was just having trouble finding them; not all indexes are created equal, and a cookbook may class a bean burger under “beans” but not “burgers” or “sandwiches.” I tried as many terms as seemed reasonable and ended up with three choices: a bean burger I’ve made many times, a lentil burger that lacked a certain appeal, and a chickpea patty that I think I made once about 10 years ago. 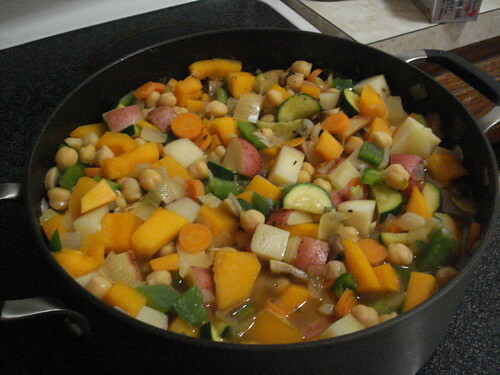 The Vegetarian Times Complete Cookbook recipe called for few ingredients: canned chickpeas, some of the reserved liquid, oats, garlic, salt, pepper, and oil with which to cook it. It’s a simple recipe. 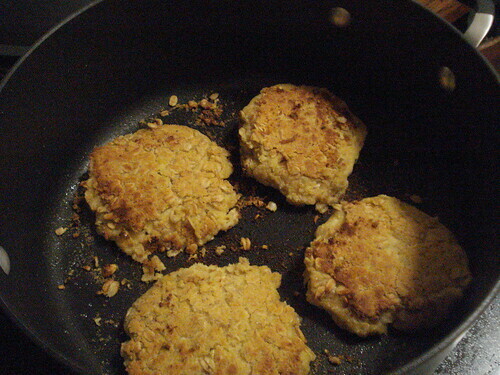 You drain the chickpeas and reserve the liquid, puree the chickpeas in a food processor with just enough of the liquid to make a smooth paste, mix it up with some oats and minced garlic, season to taste, and cook in a lightly oiled pan for about 8-10 minutes per side.The patties were a little fragile, shedding chunks when I turned them, but held together well enough for a slightly sloppy dinner. 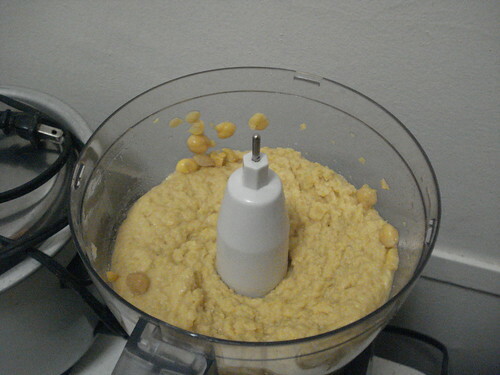 It’s possible I needed to make the chickpea paste a little wetter, or add a bit less of the oats. 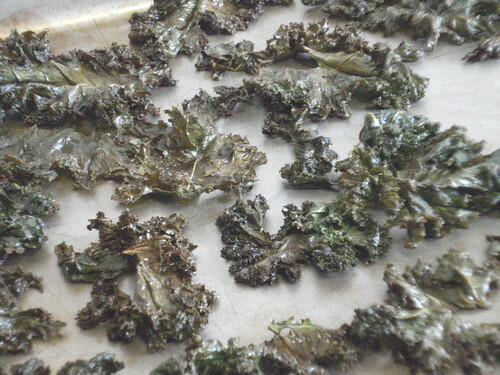 But they tasted good, with a nutty chickpea flavor and aroma. I served them on basic hamburger buns with a bit of mustard, and if I’d had mayonnaise on hand it would probably have been a nice complement. 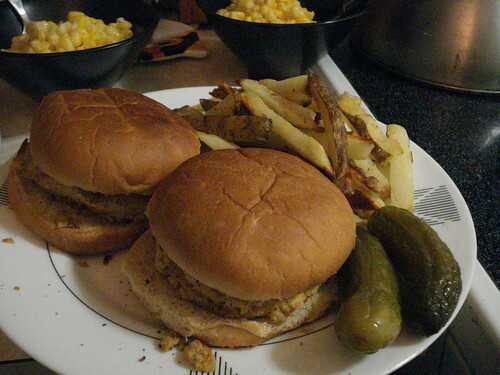 I had some russet potatoes on hand too, so I made oven fries to go with the chickpea patties. 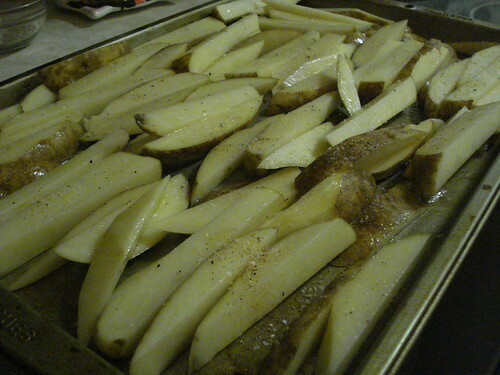 I scrubbed the potatoes and sliced them into fairly thick fries (skin still on, of course), tossed them with olive oil and some salt and pepper, and baked them in a 450-degree oven for a bit less than half an hour, turning them a couple of times for even browning. 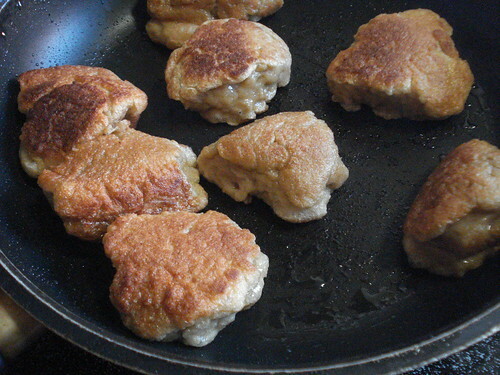 They were yummy, with a strong potato taste and no oily overtones. There were crispy edges and rich, smooth interiors. Nice. 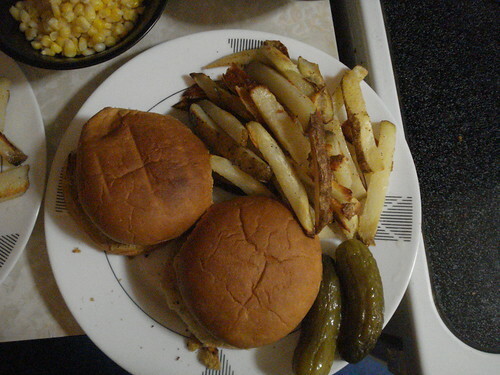 I rounded out the dinner with some corn and a few of my homemade pickles, which were as close to a green vegetable as we were going to find in the house until payday. (I know. Shut up.) 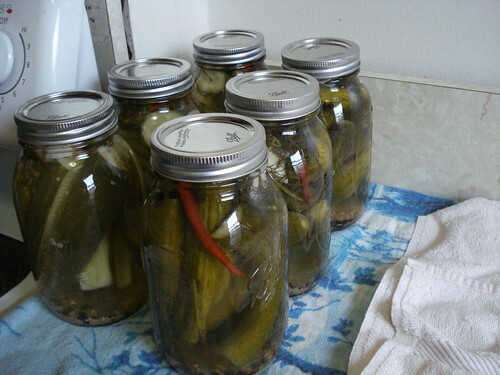 These were the hot-pepper pickles, which continue to pack a serious punch. Last fall, I laid plans for a four-week vacation this summer. We get generous leave benefits where I work. We also have a sabbatical program, but I’m still a few years away from qualifying for my second one; however, I realized at some point that I could use my accumulated personal leave to get a nice long break without waiting until 2014. So I made the appropriate requests and got approval and got the time onto the calendars. I had second thoughts about the wisdom of this plan back in April, when I was overloaded with projects at work and busy with volunteering and other obligations outside the office, and no days off in sight. But I held fast, and soon the glorious day arrived: July 18, my first weekday of liberty. That’s right: This is my fourth week of vacation. I haven’t been blogging during that time because I’ve been more focused on a different writing project. I was hoping I’d finish a solid draft of that by this Friday, which admittedly was always an unrealistic goal; however, unrealistic goals are useful motivators sometimes, and I have a much better framework in place for the project itself now. I’m better prepared to make regular progress once I’m back at work and have a solid draft done in the next few months. End of September, perhaps? Just the right end of unrealistic to shoot for, I think. This week, however, I’ve turned my attention to food. You may remember back in July, Shauna James Ahern of Gluten-Free Girl and the Chef collaborated with friends to organize a virtual pie party. It was a smashing success: thousands of people made pies and posted pictures and comments on Facebook, on Twitter, on blogs. 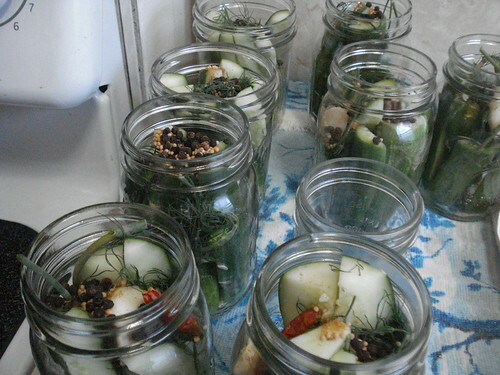 So Shauna and her friends thought a new party was in order, and today is Pickling Party day. 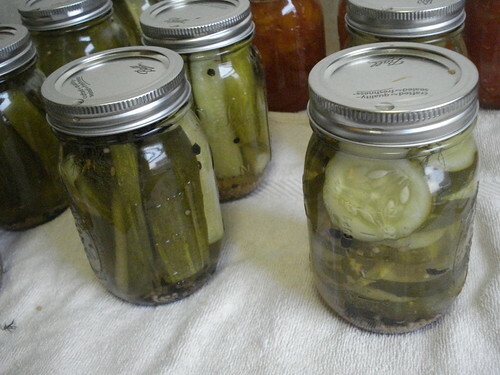 I’ve made pickles before. Back in Portland it was simple: Get some jars, get some goodies from the farmers’ market, check your recipes, do lots of cleaning, boil a lot of water, and ta-da! It’s some work but nothing complicated. In New York it’s similar, but with one twist: finding canning jars at a reasonable price. New York is an expensive place to live, and most of its retailers are serving people who don’t have a lot of space and so aren’t buying in bulk. In Portland I could walk into just about any hardware store and find 12-jar cases of pints or quarts for around $10; in New York you can buy single jars for $1.75 apiece, or more. The first year we were here, one hardware store a few blocks away from my home attempted to sell me a box of pints for $30. 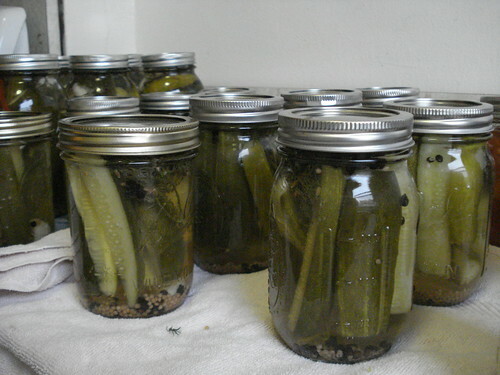 Twelve jars. I walked out in a huff. The growth of the whole and homemade foods movement has prompted more New York retailers to stock cases instead of singles. However, those cases are still $16 and $17, reflecting the higher cost of doing business here. And those retailers are far away from me, leaving the challenge of getting a heavy load of glass jars home on the subway without breakage or other disaster. I’d looked for jars on Amazon and other online outlets, but the savings in per-case charges were always more than offset by shipping fees for heavy glass. 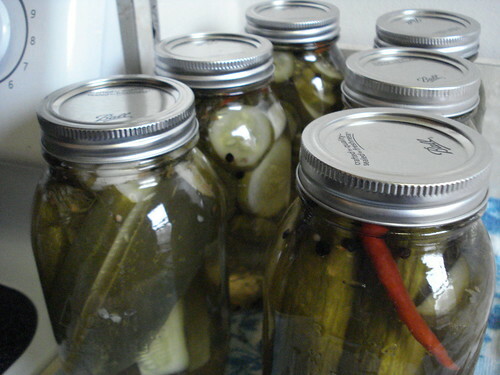 However, I kept poking around in forums and question threads, and finally found a pointer to FreshPreserving.com, the official online distributor for Ball jars. I did the math: even with shipping charges, the cases cost less than they would in the Brooklyn or Manhattan stores. And they came fast, via overnight shipping (after a day or two for the order to be processed). Now I was ready to hit the Greenmarket. As with any big project, I started by dreaming big. 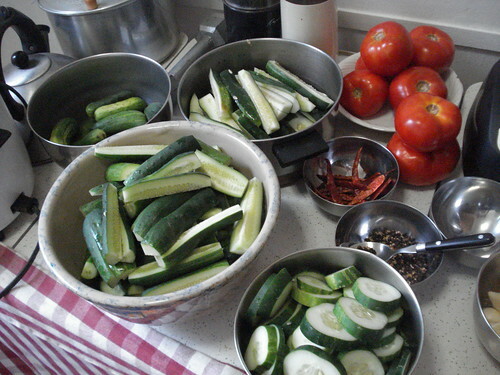 How many kinds of pickles could I make? 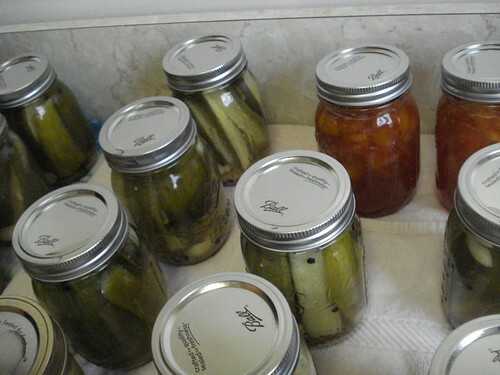 Maybe I could do several jams, since I might as well do other canning while I had the water boiling. Hey, this could be the year I make tomato sauce! What about chutneys and relishes? A leisurely browse through my main canning cookbook and some websites filled my mind with visions of pickled brussels sprouts, ginger jam, pickled garlic, habanero jelly. Then I let reality creep back in. 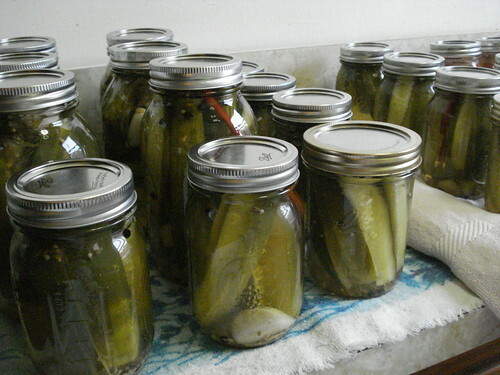 There are only so many hours in a day and only so many jars in a dozen. 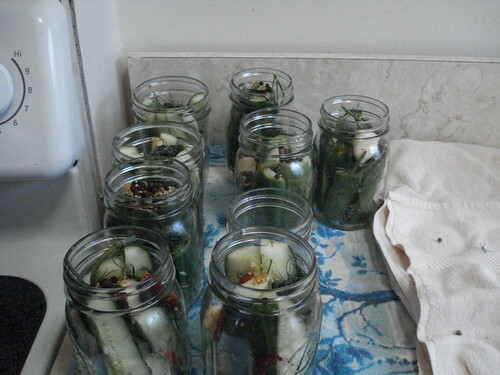 Brussels sprouts aren’t in yet; those may fill a Sunday this September but won’t do for the August pickling party. Berries are kind of expensive here, even at the Greenmarket; New York is not the berry wonderland that the Northwest is. 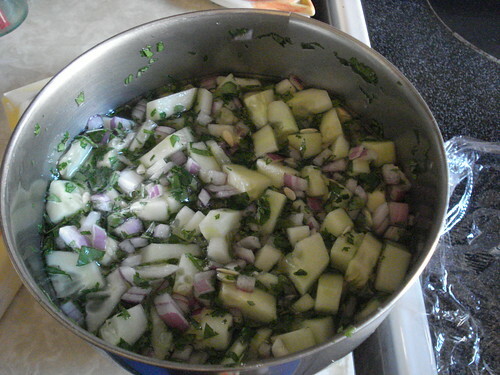 And to me pickles start and end with cucumber: crisp, dilly, with a hint of garlic and maybe a hot-pepper bite. I decided to do three categories of canning: pickles, the bulk of the effort; tomato sauce, my first foray into preserving the Greenmarket’s red jewels for cold weather; and peach jam, an easy old standby. (I had to remind myself that I don’t actually eat nearly as much jam as all that, not enough to stock up jars and jars of the stuff.) I hit the market on Monday with my rolling cart and a list in my mind. 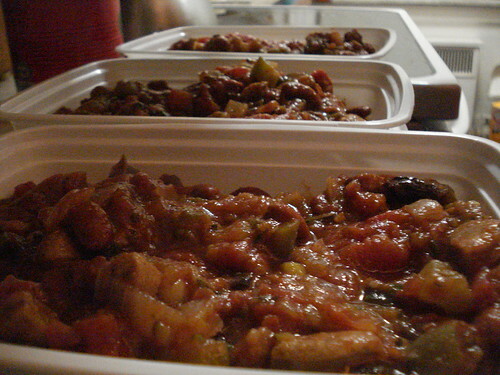 I trundled away some time later sweaty, my foot aching (I’m recovering from plantar fasciitis), and laden with fresh produce destined for the jar, the freezer or that night’s dinner. Once home, I set aside the things for the next day’s work, used some of the tomatoes for a pasta dish for dinner, did some necessary housecleaning, and took a few minutes to start macerating fruit and herbs for soda syrup (another Gluten Free Girl offering; I followed her recipe to make cherry-basil, and followed the basic proportions to make peach-mint). Then I rested for the evening, knowing I’d be busy the next day. And so I was. Once I’d finished breakfast and caught up with my Facebook Scrabble games, I got to work. 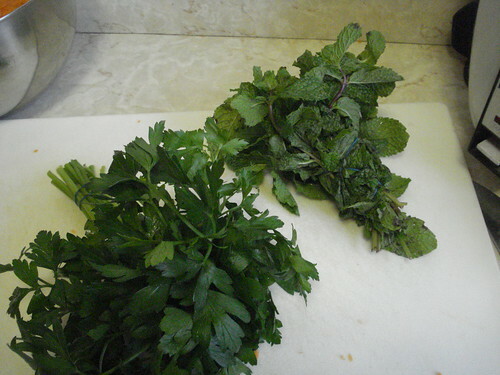 I started by getting the soda syrups out of the way, pureeing the macerated fruit and herbs and then filtering out the solids. Then I got the leftover dishes done and put away, dug out the few odd leftover canning jars and lids, and figured out my game plan. 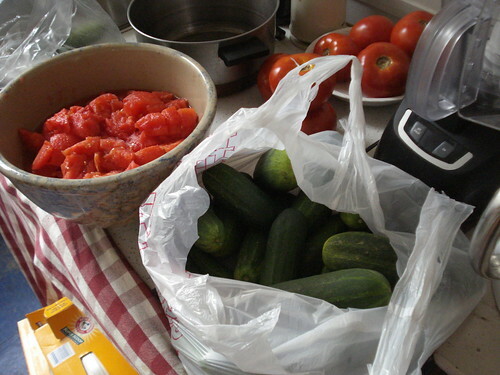 The jam and the sauce would require cooking before canning, so I’d get started on those. 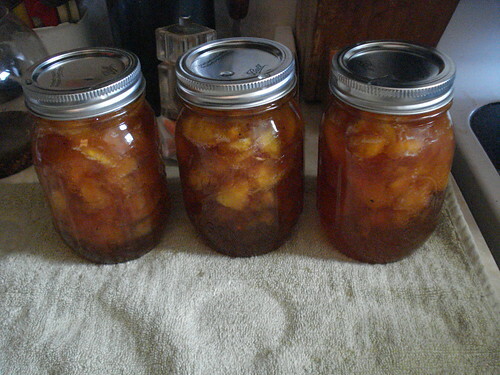 I boiled water so I could dunk scored peaches and tomatoes to peel them; chopped the peaches and got them cooking with sugar, lemon juice, nutmeg and cinnamon; chopped the tomatoes and set them aside until I had a burner free for the tomato sauce; and started washing canning jars while the jam cooked. 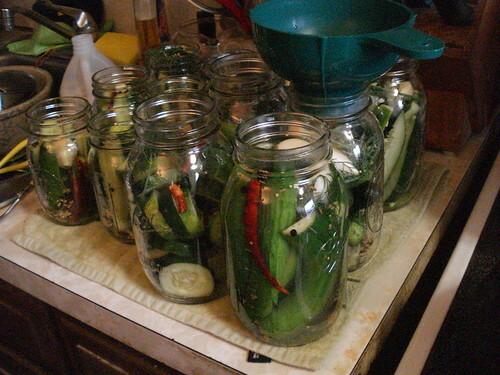 I pulled out my tall stock pot — that would be my hot-water-bath canner, tall enough to accommodate the quart jars. I washed away the dust, found the tidy round rack that goes in the bottom, poured in water, and started it heating on a back burner. I pulled out my pressure cooker, which is essentially an enormous pot since I don’t have a complete pressure gauge for it and so don’t feel comfortable using it for canning. That would be my pot for sterilizing the jars. 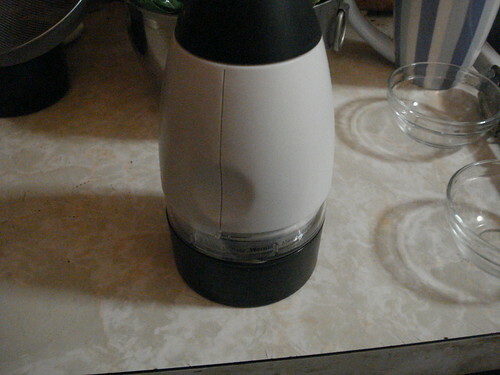 I filled it with water and started that boiling as well. 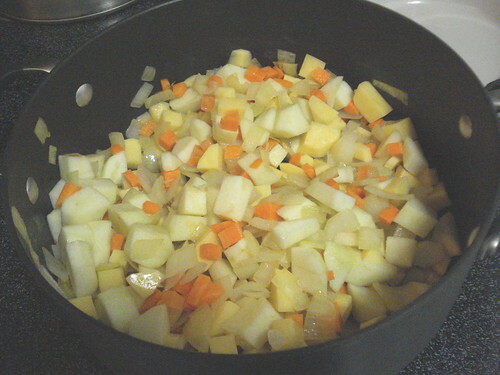 I pulled out a smaller saucepan to keep hot but not boiling for the lids. 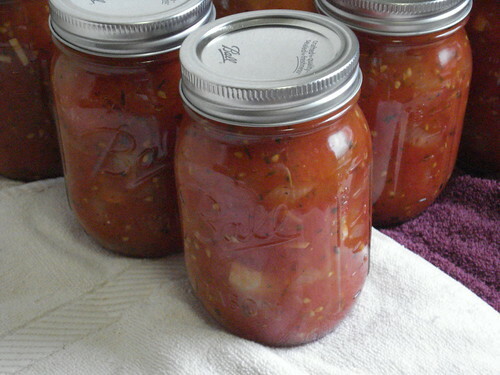 While the jam cooked, I washed and sterilized jars, laid out towels on the counters, and chopped onions and garlic for the tomato sauce. When the jam had hit its temperature target I used a canning funnel to ladle it into jars, carefully laid on the clean lids with tongs, tightened up the rings, and lowered the jars into the hot-water bath. 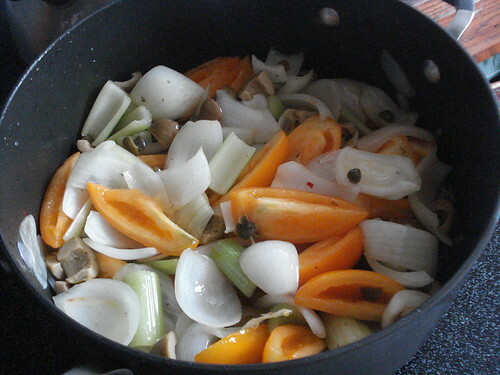 Then it was time to start the tomato sauce: I sauteed onions, garlic and herbs in olive oil, added the chopped tomatoes and their bright-red liquid, and let the works simmer for about half an hour. 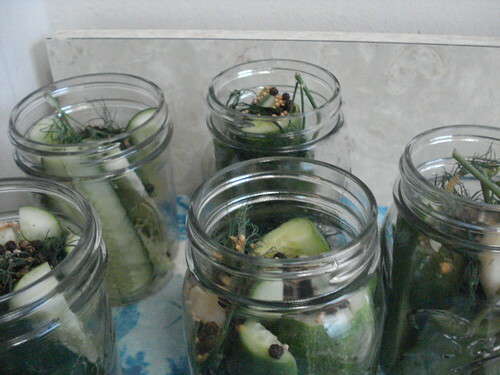 While those were in process I moved now-sealed jam jars aside to cool, washed and sterilized more jars, and started to pull together my pickling materials. 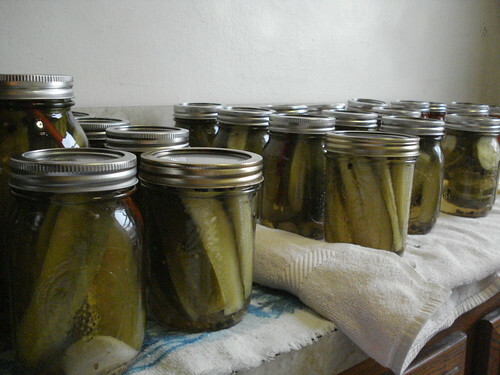 I love dill pickles in nearly any form, so I decided to do several, and I washed and sorted my cucumbers accordingly. 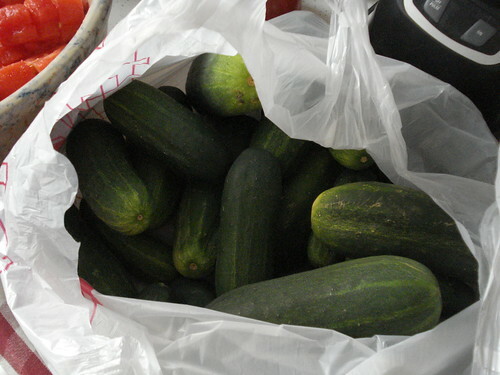 A medium-sized bowl of little cucumbers to pickle whole. 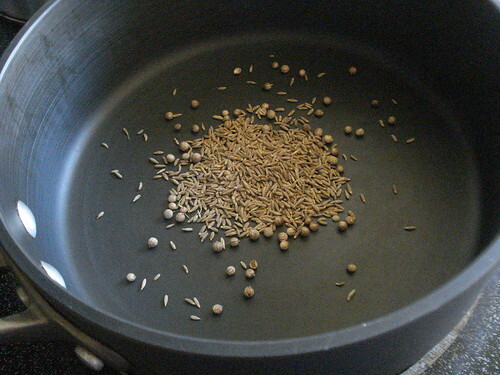 Two bowls of spears, some thicker and some fatter. 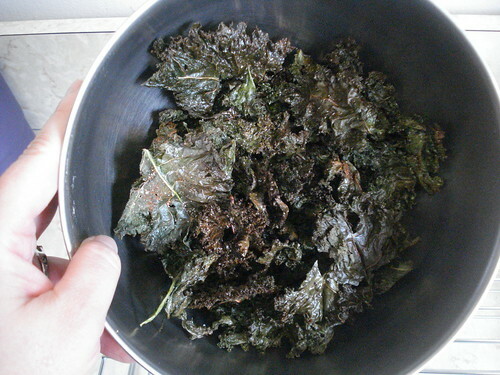 A bowl of nice round chips. 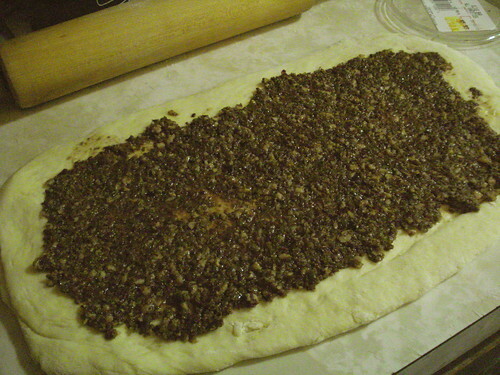 (I have a crinkle-cutter, but I opted for smooth slices this year for a cleaner look.) 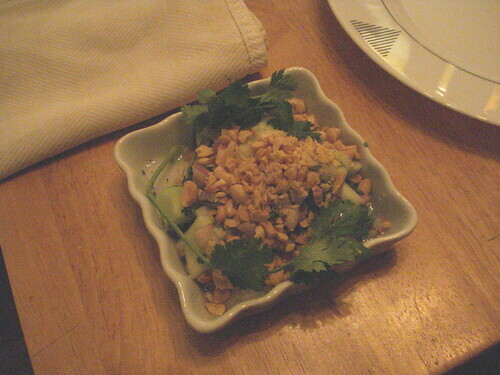 I mixed up a pickling spice dominated by peppercorns, mustard seed and cumin seeds. 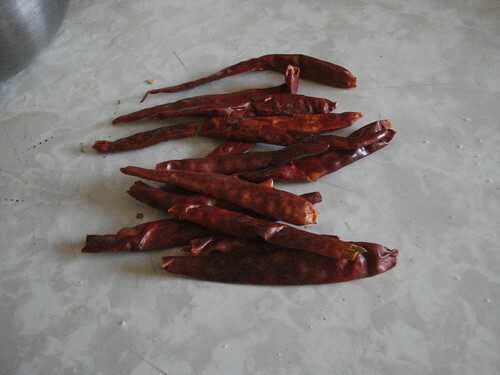 I filled a small bowl with promising-looking dried chiles. 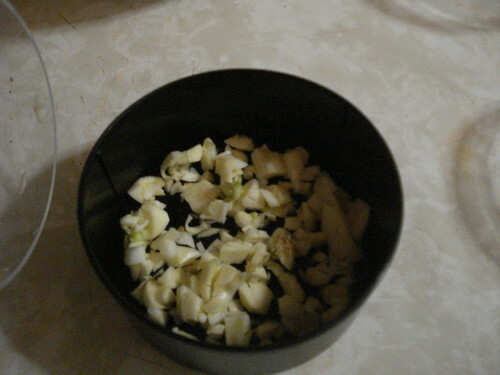 I peeled clove after clove of fresh garlic. I trimmed the largest stalks out of the dill, leaving individual tufts of the feathery fronds. 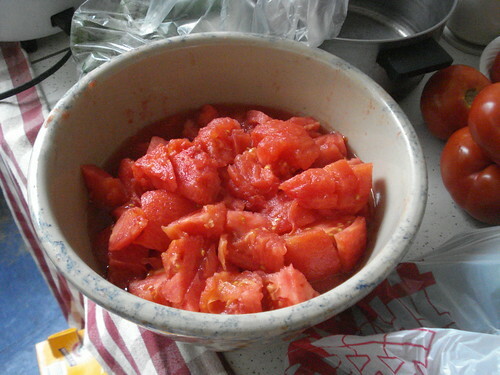 And when the tomato sauce was done and in jars, I used that burner to prepare my brine: a ratio of 1 cup vinegar to 1 cup water to 1 tablespoon of plain salt. 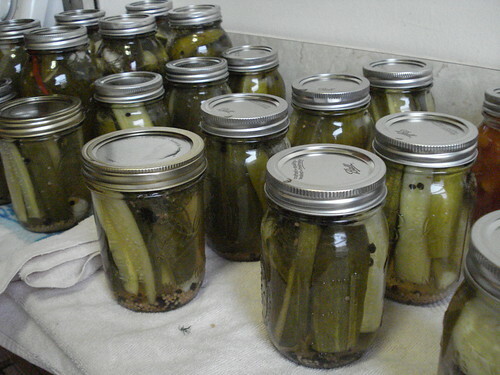 I filled my jars: whole pickles in the widest-mouth jars I had, spears in the quarts or pints as their length allowed. I dropped in garlic, spice, dill. 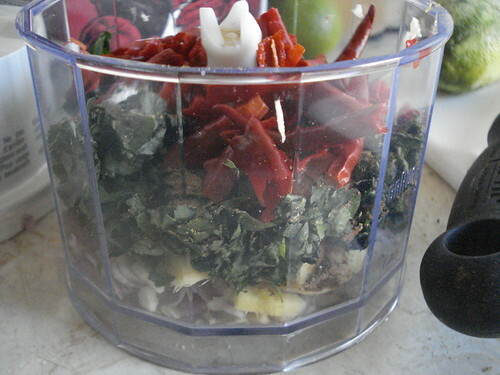 Some jars got chiles. The individual jars are going to have subtle variations in flavor; the spice mixture didn’t want to stay uniform, and some jars have more mustard seed while others have more peppercorn. That’s OK. I also added a sprinkle of alum powder, which I was advised to do years ago by a friend who knows a lot more about pickling than I do; I’m not sure exactly what it does but my pickles have always been good so it can’t hurt. Finally it was time to add brine. I had to keep mixing more, but it doesn’t take long for the salt to dissolve and the mixture to reach a boil again, and my batches of brine kept pace with my batches of jars going into and out of the hot-water bath. 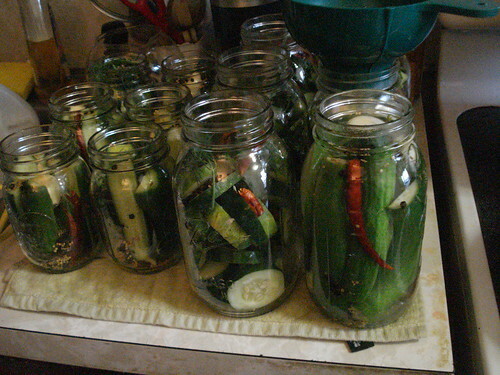 While pickles sealed and jars sat waiting their turn, I set aside the jars I hadn’t used, washed the pots and utensils, and got the rest of the kitchen in order. 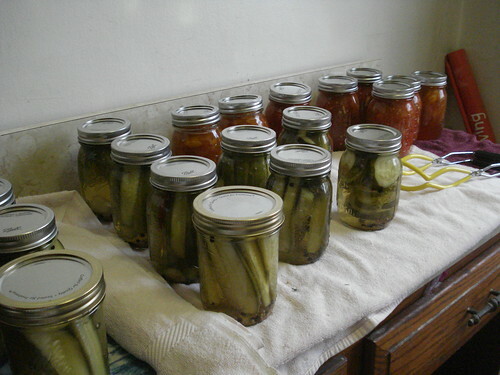 At about 6 pm I was pulling out the last 7 jars of pickles; I’d managed to produce 6 quarts and 14 pints, along with the 5 pints of tomato sauce and 3 1/2 pints of jam. I was ready for a shower and a drink. 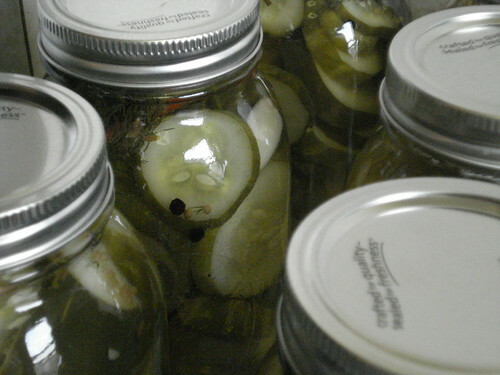 I’m looking forward to eating pickles. Spears alongside a salad. Slices in a sandwich. Little whole pickles crunched down in two or three bites. 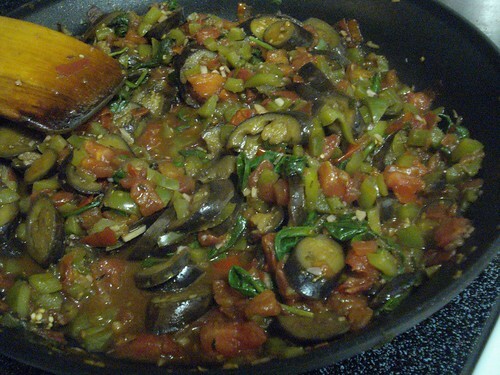 Lidia’s Italy is another cookbook I bought through a club and hadn’t used until now. Lidia Bastianich is a cookbook author, TV personality and restaurant owner (most notably New York’s Felidia), and it is clear she knows her way around Italian cuisine. The book is organized by the regions of Italy, with a wonderful range of flavors and ingredients within each chapter and from region to region. 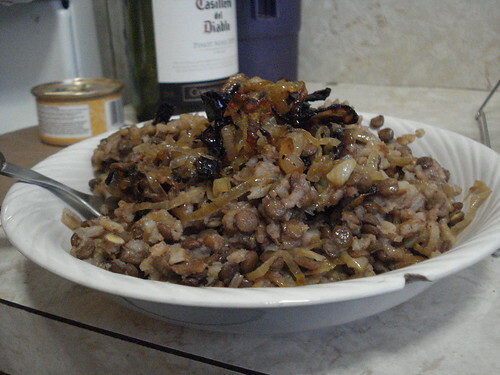 I chose two recipes from the chapter on Sicily. This seemed appropriate; the Sicilian climate is hot and intense, which meant the summer selection of Greenmarket produce would find good use here. 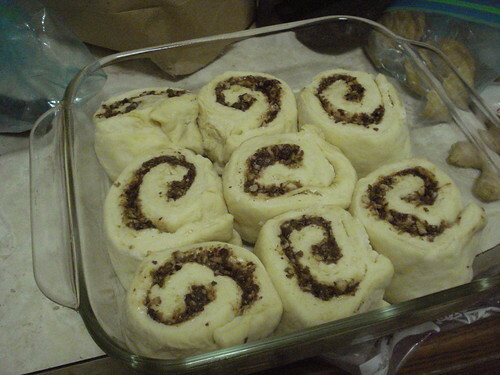 I wanted something I could make ahead, because I was having friends over for a sewing party, so I wanted to spend most of my time out of the kitchen once they arrived. 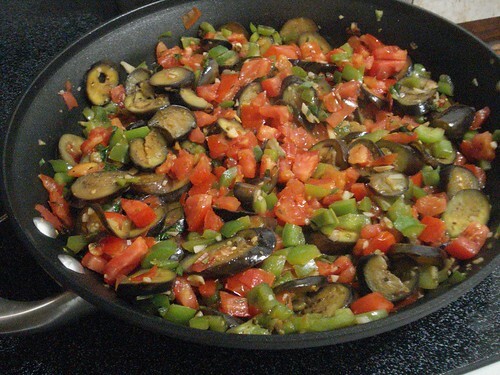 I opted for a caponata or eggplant dish, which I could offer as a snack while we worked, and a fresh tomato sauce for spaghetti, which I could add to noodles when we were ready for dinner. 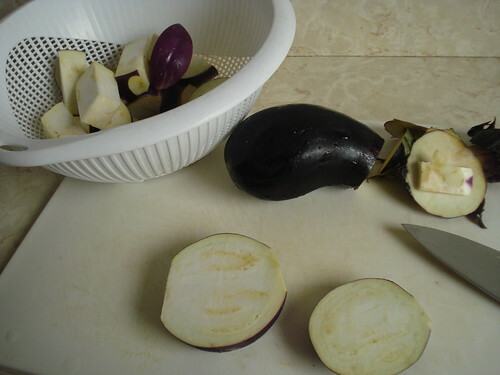 The smothered eggplant dish took a bit of preparation. 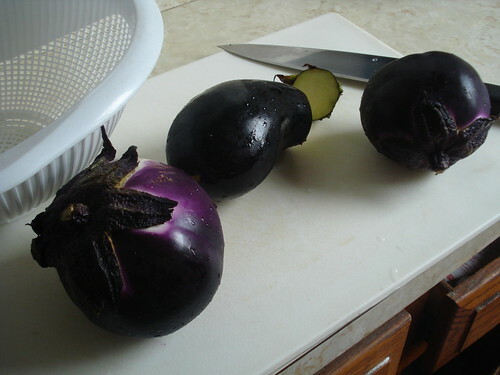 I began with the eggplants, three modestly sized beauties from the Greenmarket, which I cut into chunks about an inch wide and two inches long. More or less. Quite a few chunks were closer to an inch and a half or an inch, but I didn’t think that would matter. 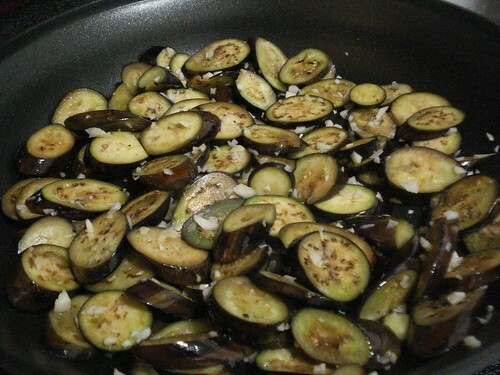 I tossed the eggplant chunks with some kosher salt and put them in a colander for the excess moisture to be drawn out and drained away. 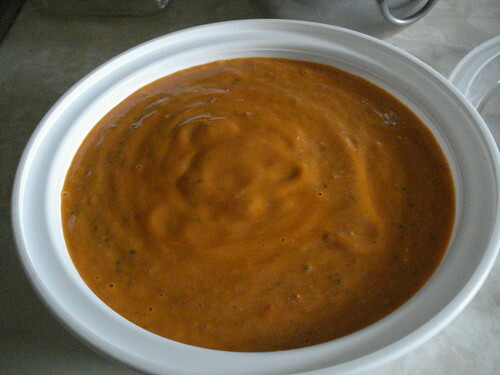 Next, I cut about two pounds of plum tomatoes into wedges, scooped out the seeds, and put them in a sieve for their excess moisture to drain as well. 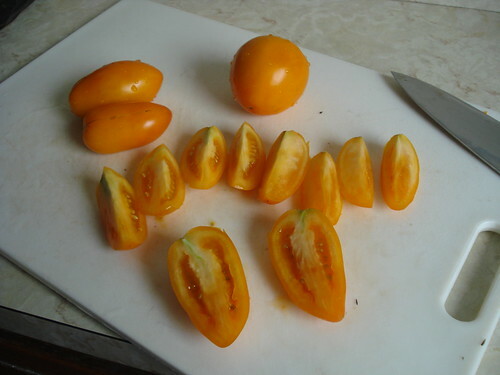 The tomatoes were orange, a lovely but unexpected color. 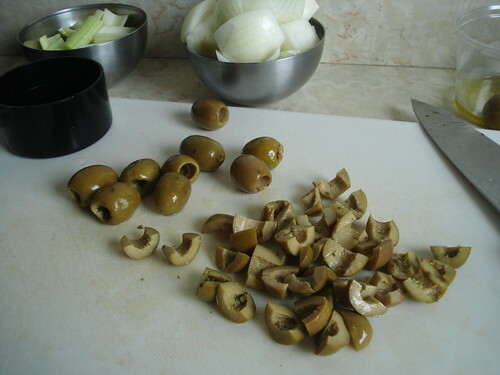 I also chopped up some onions, celery and green olives, drained a jar of capers, and plucked and rinsed 12 large basil leaves and set them aside. I took a few minutes to set up the flavoring syrup: I combined half a cup of red wine vinegar, half a cup of water and two tablespoons of sugar in a saucepan and brought the mixture to a boil, then let it cook until it was reduced by about half. 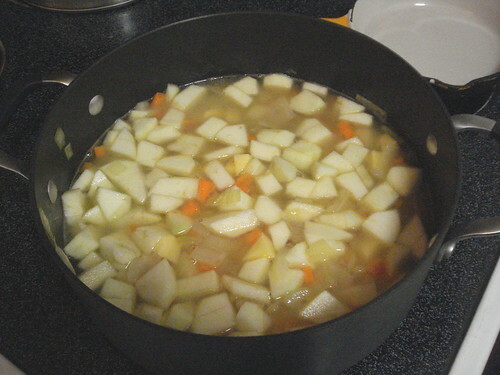 This was easy to do, but I quickly discovered that it’s a bad idea to be downwind of the gust of steam from a pan in which you are boiling vinegar. That is one intense smell. 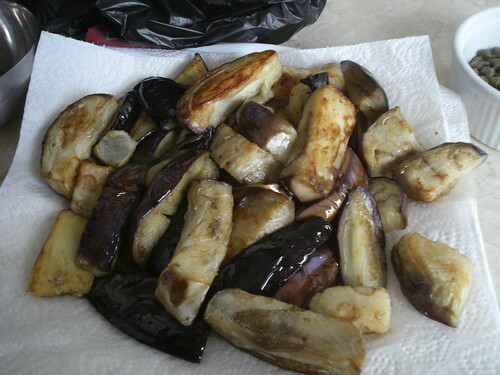 My sinuses sterilized, I moved to the other side of the stove and set about frying the eggplant, which I had rinsed and dried after its salting time was up. 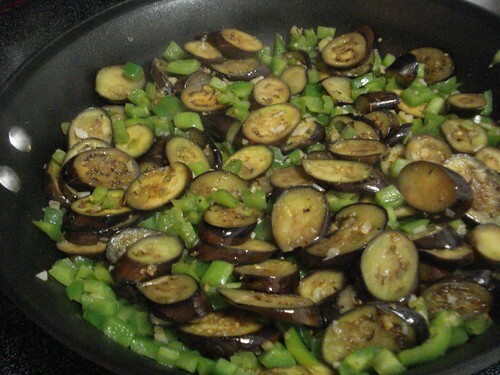 I put about a cup of canola oil into a large pan — the cookbook says to use a skillet, but I thought my big Calphalon pot would be a better choice — and heated it to medium, then added the eggplant and fried the pieces, stirring often to ensure even cooking and coloration. 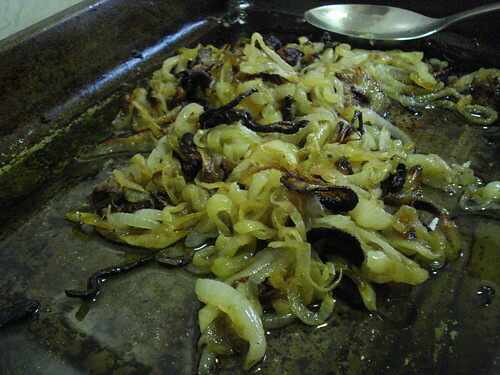 I removed the fried pieces to a dish lined with paper towels and let the excess oil drain off; I then discarded the cooking oil, wiped out the pan, and added a smaller quantity of olive oil to heat. 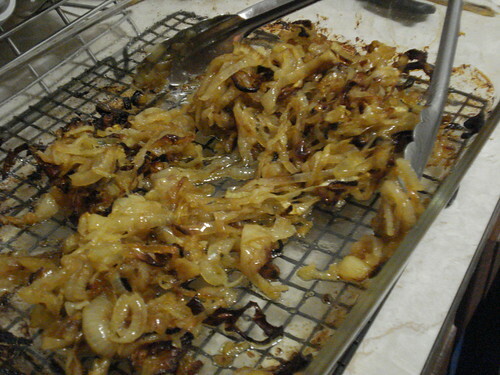 When it was warm, I added the onions and celery and a bit of salt, and cooked them until the onion had softened and just begun to brown, about 8 minutes. 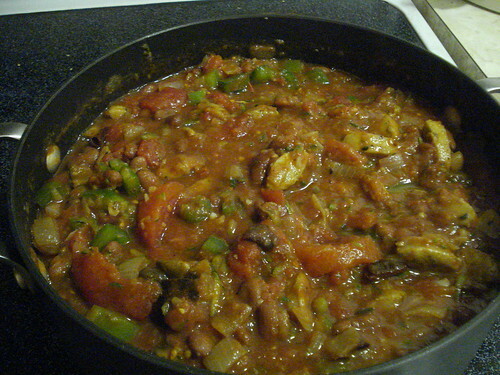 Then I added the olives and capers, and stirred the mixture until the new ingredients began to sizzle a bit. 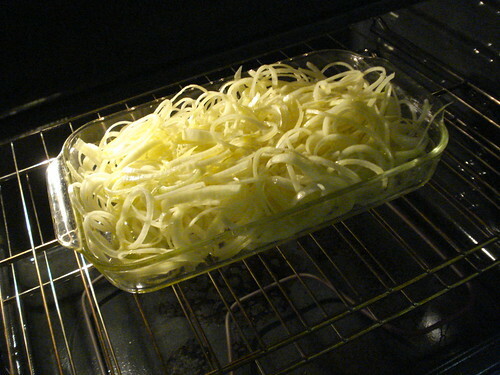 I added the tomato wedges and a little more salt, stirred everything up, and let it cook for about 5 minutes. 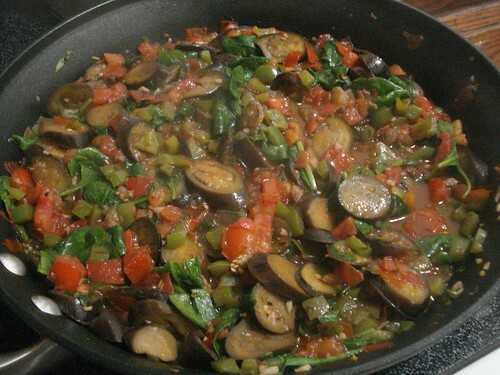 At this point I added the eggplant back to the pan and mixed it in, then poured in the vinegar syrup. 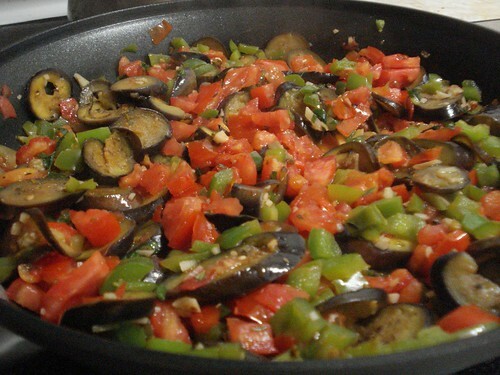 I let this mixture cook for a few minutes, then drizzled in a couple of tablespoons of olive oil and let the mixture cook for about 10 minutes more. 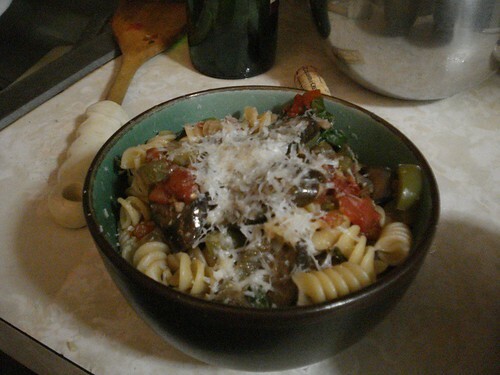 When the timer went off, I turned off the heat, tore up the basil leaves and added them to the pot, and pulled the whole pan aside to cool to room temperature. 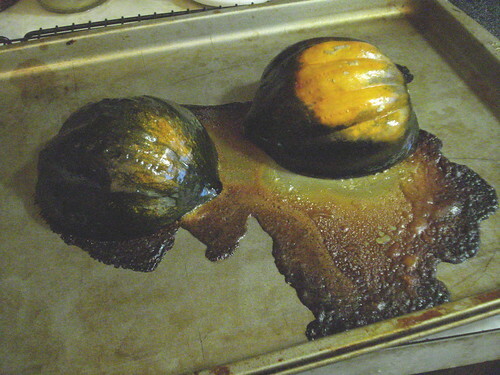 I also began to rethink my serving plan. 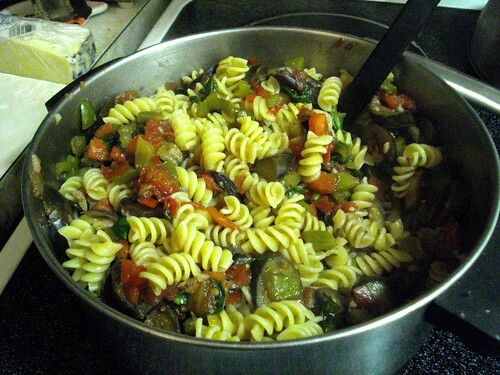 I had expected the vegetables to fall apart into a softer, more indistinct mixture, based on comments in the introduction such as “use it as a sauce for pasta or as topping for bruschetta.” The chunks in the pan were certainly soft, but still far too large to make an effective topping for bread or crackers. 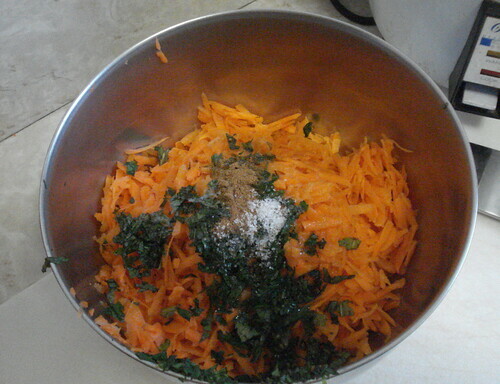 I decided to postpone any further decision until the mixture was cool, and turned to my other dish. 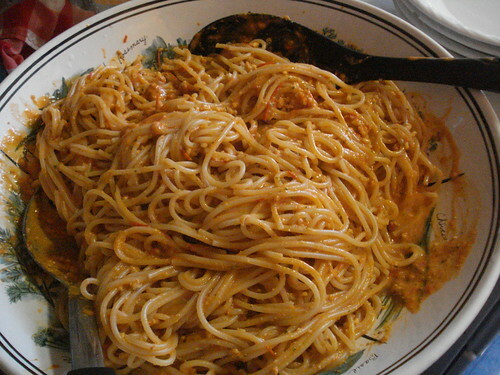 Pesto Trapanese is a much faster dish to make. 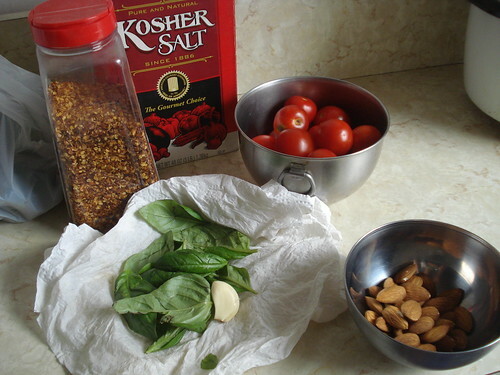 I rinsed and dried about three-quarters of a pound of globe tomatoes, and put them into a food processor with 12 large basil leaves (clearly a popular quantity), one clove of garlic that I’d peeled and crushed with the flat of a knife blade, 1/3 cup of toasted almonds, a pinch of red pepper flakes and about half a teaspoon of kosher salt. 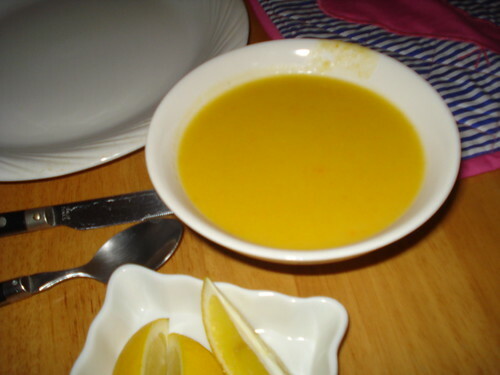 I processed the mixture until it was a smooth liquid, then drizzled in about half a cup of olive oil and kept processing until the puree was a bit thicker and even in texture. I think it may have been meant to be thicker, but my tomatoes were a little larger than the cherry tomatoes called for in the recipe and probably had a bit more liquid in them. 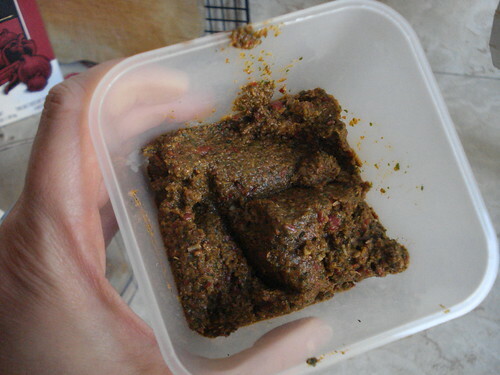 If I had been making the pesto closer to dinnertime I could have just set it aside, but since I was working ahead I put it in the refrigerator. 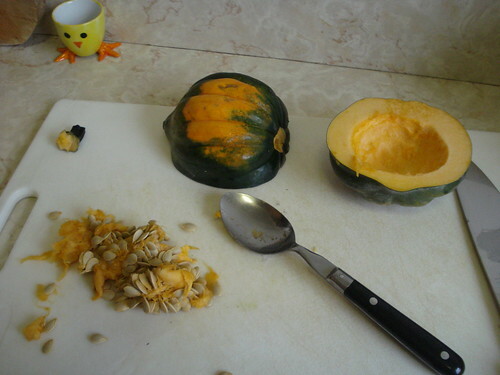 Not long afterward, my friends arrived and we sat down for a snack before turning on the sewing machine. 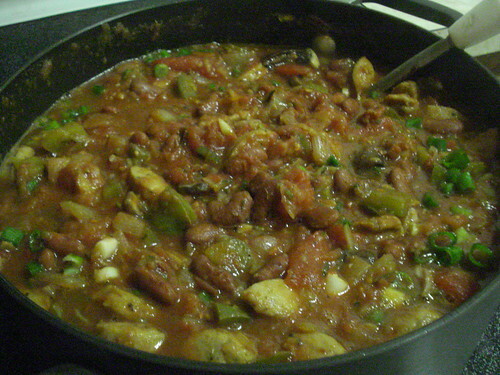 The eggplant mixture was indeed too chunky to easily spread on bread or a cracker, though we tried. But it tasted phenomenal. 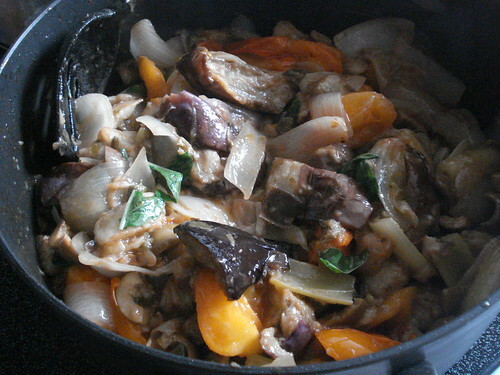 The flavors of the individual vegetables came through, and the overall mixture had a great tangy undertone (from the vinegar syrup, no doubt) and a richness, with a thick base from the portion that had broken down a bit. 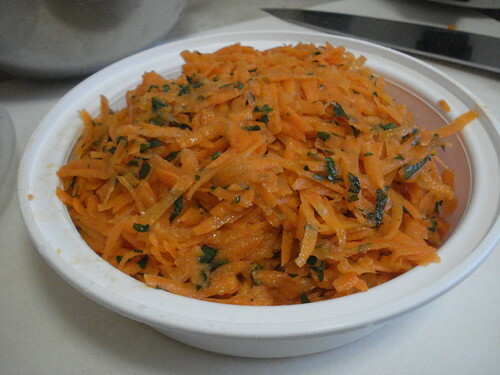 I think that if I were to make this again and wanted to use it as a dip or bruschetta topping, I’d throw it in the food processor and give it three or four pulses to break it down just a bit more. But in its chunky form I’m itching to try another of the suggestions from the recipe header: “use it as a sauce for pasta.” That’ll be Wednesday night, I think. 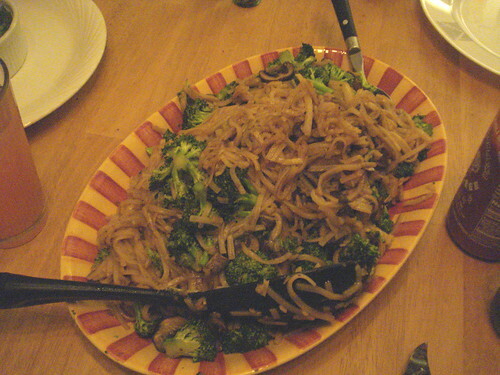 When we were ready to have dinner I cooked a pound of dried spaghetti. I realized while the water was coming to a boil that I was supposed to have brought out the pesto earlier so it could come to room temperature. 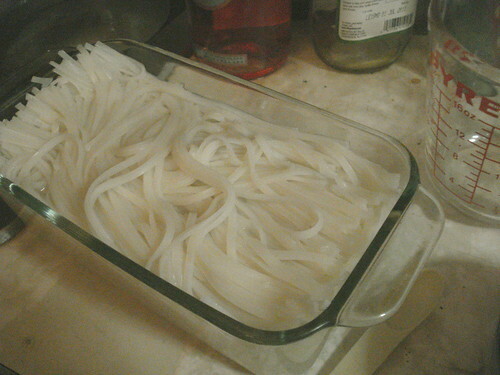 Luckily it was fairly warm in the kitchen, and the sauce wasn’t really cold by the time the spaghetti was done. 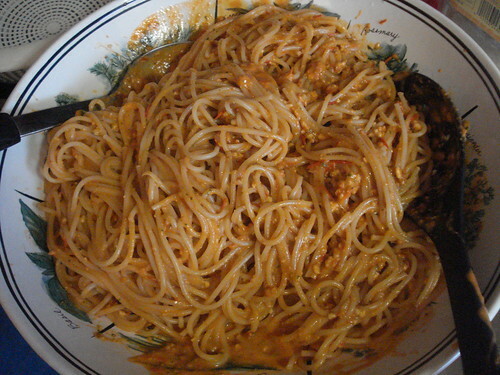 I drained the noodles and put them into a large pasta bowl, then added the pesto sauce and tossed the mixture together until the spaghetti was evenly coated. I passed around a chunk of Parmigiano-Reggiano and a microplane zester, and invited people to add cheese if they wanted it. Everyone raved over this one, including me. 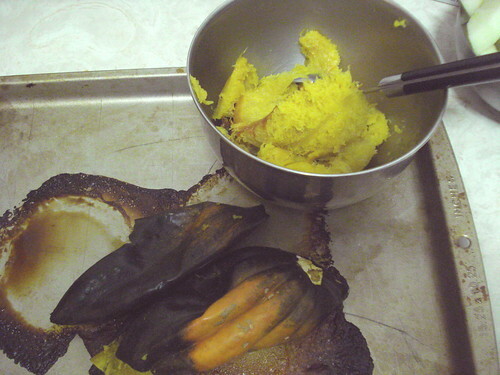 I know it’s bad form to praise your own cooking, but I didn’t feel I’d really done that much, just followed excellent and simple instructions. 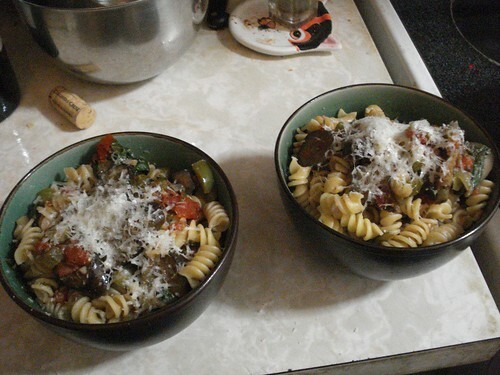 I’m going to have to make this one again and again. 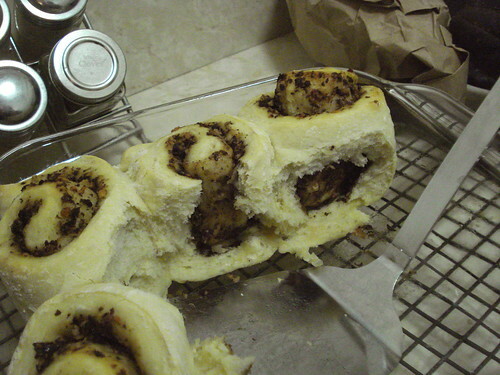 In fact, I may have to do a serious Greenmarket run and make a large batch to freeze in portions. I don’t know how well the sauce freezes; we didn’t have enough left over to find out. 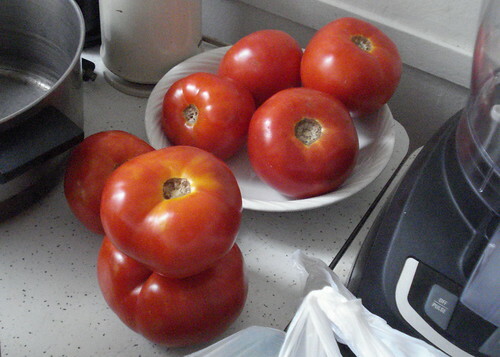 But I think this deserves to be in weekly rotation for as long as tomatoes are in season. Verdict: Success. 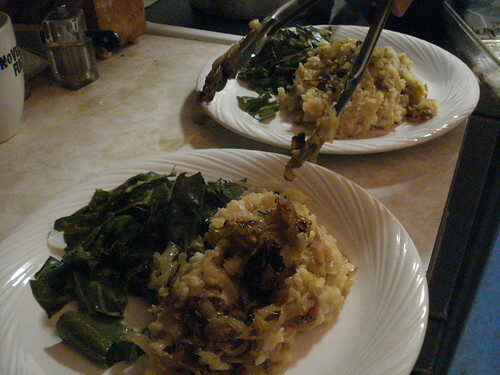 Both the work-intensive dish and the easy one were well worth doing again.